Each bracelet contains handmade glass and/or natural stones that sparkle brilliantly surrounded by Hematite ovals, pyramids and stars, Jade, Lapis and Agate for grounding. Prices are: $199.00 each for sizes 6-7, $259.00 for sizes 71/2 - 91/2, $299.00 for sizes 101/2-12. Anklets are priced at $179.00 in sizes 7 1/2-12 All prices include box, certificate of authenticity signed by Michael. Shipping fees are extra. We can ship outside of the U.S., however shipping fees are based on your postal code. Please specify your size when placing your order. Each is hand made one at a time by Michael J. Kouri, himself. The stones are hand selected to insure their positive energy flow. The Aura/Chakra bracelets remind us of the 7 Chakra Energy Centers ranging from the base of the spine to the top of the of your head. No two bracelets are the same and the stones may be different from the sample above depending on what is available. Each is as unique as Michael himself! #MW12 / 9 inch the Large Man sized Pendulum features Natural Quartz on Gold Filled chain with a Sterling Silver cap. 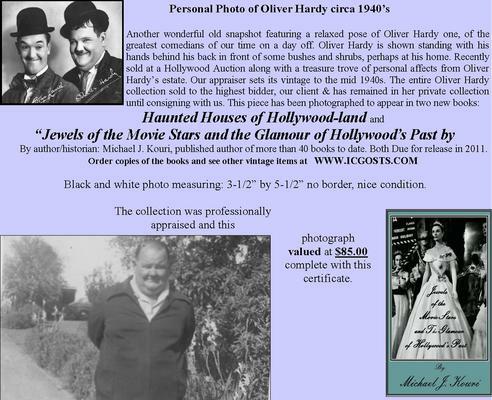 (626) 791-1129 10am-4pm Pacific Time, or email us directly at ICGHOSTS@hotmail.com. We accept all major Credit or Debit Cards, which can be paid over the phone or by email through our very safe server. We ship on Wednesdays through the USPS. Thanks! Did you know Michael is also a professional soloist? Long before sharing his psychic gifts with the world, Michael performed in some of the most famous touring Broadway shows, has sung as a back up singer and worked in churches playing the piano, organ and harp and or singing wedding ballads. Michael has performed for hundreds of weddings, funerals and in Liturgical services throughout the Los Angeles Arch Diocese for the past 30 years. Now you can listen to Michael as he shares another of his God given talents through his Musical and Meditation CD's. American Dreams, As If We Never Said Goodbye and Christmas Dreams with Michael J. Kouri are just a few of the titles. To order your copies use the menu below. 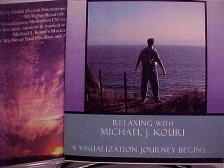 based on his newest seminar that teaches one how to relax and how to meditate through creative visualization. A must have for everyone. All prices include U.S. Shipping & Sales Tax we can ship world wide, just send us your zip code for shipping rates outside the U.S. Whenever you see Michael on television, he's wearing an unusual looking bracelet that journalists always comment on. Many years ago, Michael's friend Mary gave him a wondrous gift. Michael had a serious bout with Kidney Stones and was faced with surgery. She read up on the Natural stones that could help to heal the body against the production of Kidney Stones and created an attractive bracelet using unusually cut Natural Stones for Michael. Michael began to wear the bracelet and returned to his doctor three weeks later. The doctor was stunned because when he X-rayed Michael, the stones seemed to be gone. Michael saw the X-rays before and afterward. The doctor came into the room scratching his head and I asked what was up. He said " I don't get it, three weeks ago you could hardly stand straight bent over in pain, our x-rays showed your kidney's were filled with stones and now they're completely clean....what have you been doing in the past 3 weeks?" 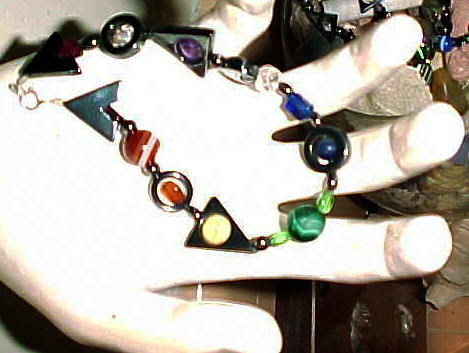 Michael simply raised up his left hand showing the doctor his Aura/Chakra bracelet and said he began wearing this bracelet. The doctor looked in disbelief then asked Michael if he could get one for his wife and another for one of the nurses on staff at the hospital who also suffered from Kidney Stones. Michael asked Mary to make more, but instead she showed him how to make them himself. Michael hand picks the stones he uses in all of his unique and jewelry. He created Pendulums, Labrodorite Bracelets which help people connect with their spirit guides, Chrysacola which aids with sleep deprivation, Amethyst, Citrine and many, many more. Order a custome Bracelet from Michael or Reserve a Psychic Reading and let Michael tell you what colors are missing from your Aura and he can make a special bracelet for you to bring these energies back into your Chakras and Auric fields. by antique beads reflect the the 7 colors of the rainbow. Natural Stones are an integral tool for healing Amethyst, Moonstones, Coral, Opals, Jade, Citrine, Agates, Lapis Lazuli, Quartz, Tigers Eye and other stones have healing qualities too. Michael started making these bracelets so that you and others might experience their beauty and or healing qualities in your own life. You'll be singing along with Michael and the Bob Cohen Orchestra of Boston. Michael has performed for Presidents, Royalty, Celebrities and thousands of people who've followed his incredible career. Each and Every Bracelet comes complete with a certificate of authenticity describing the stones used and their healing properties, a certificate of authenticity and is hand signed for you by Michael. Please call our offices at (626) 791-1129 to place your order and specify wrist size. Each bracelet is hand made by Michael himself at his studio in Pasadena, Ca. We can ship in time for the Holidays if you're order is received by December 15, 2008. Overnight shipping is available for U.S. orders only. All orders outside of the U.S. must pay by credit card. 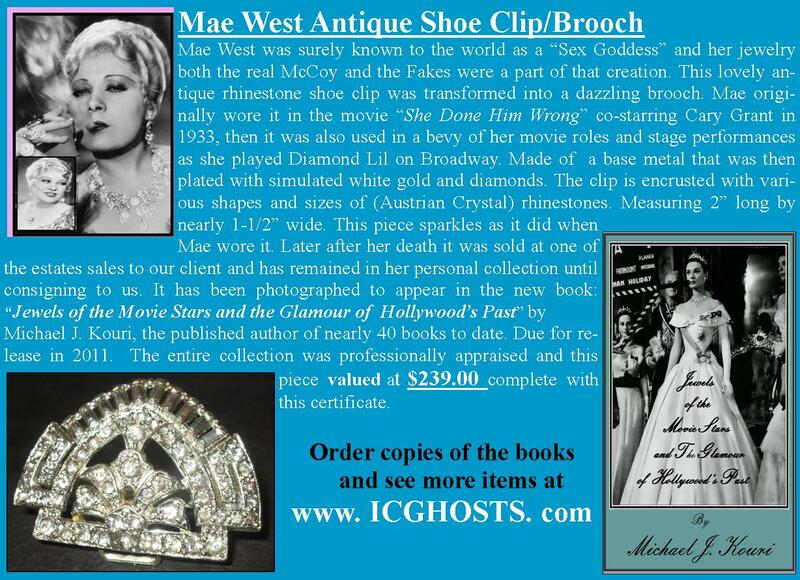 Costume jewelry once owned by Mae West. 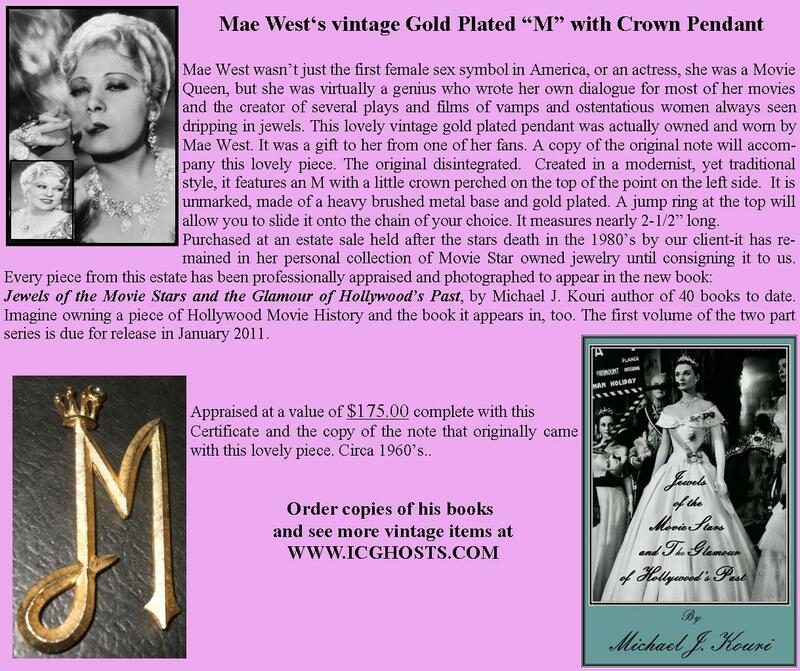 Yes, you read this right, Michael actually knew Mae West and was one of her featured Medium's at the weekly Seances she held at her Ravenswood Apartments in Hollywood, Ca. After her death, Michael wanted to own something to remember her by and attended one of the Estate Sales held after the Movie Legends death in the 1980's. Having purchassed a Giant Travel Steamer Trunk with Mae's name stenciled on the front. 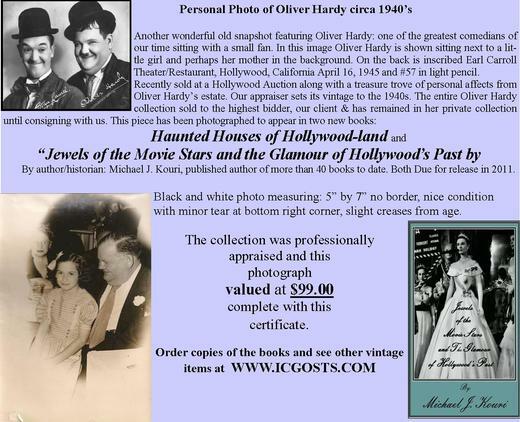 It was sold to him "as is" because it was do badly delapidated, but once opened, Michael was stunned to find a treasure trove of Vintage Jewelry, personal momento's, photos of Mae from her films and much more. 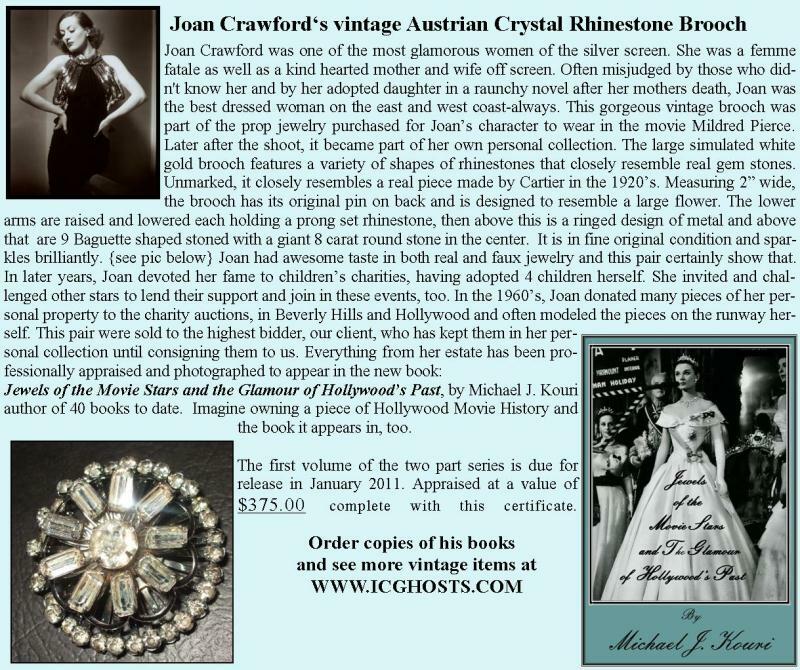 With more than five thousand pieces of jewelry given to the Film Maven by her adoring fans, friends and other Movie Stars, Michael decided to sell some of these treasures to her fans around the world. 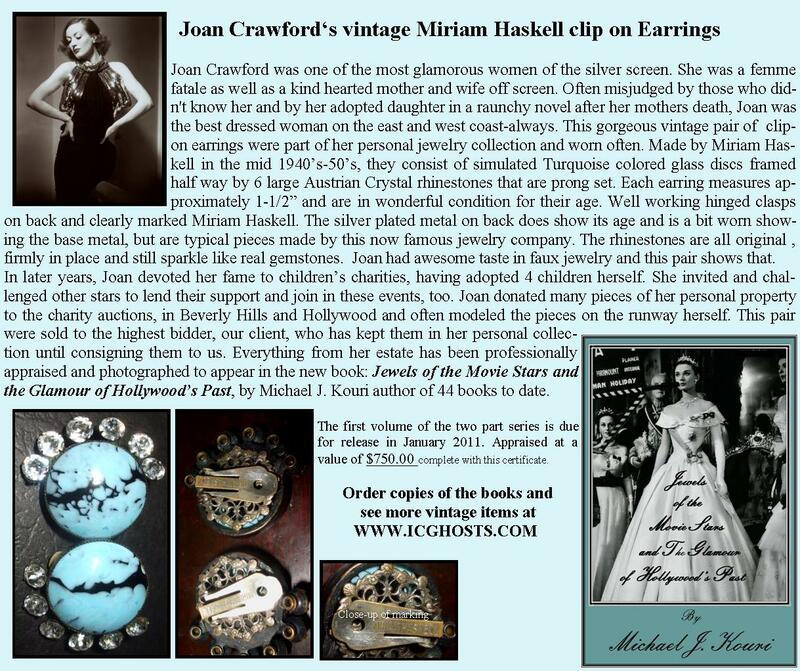 Each piece is attached to a provenance card telling How Michael came to own them, Professional Appraisal and a photo of Mae West wearing some of the pieces from her collection. Many people who've bought these pieces claim they can feel Mae's Spirit around them when they wear them. 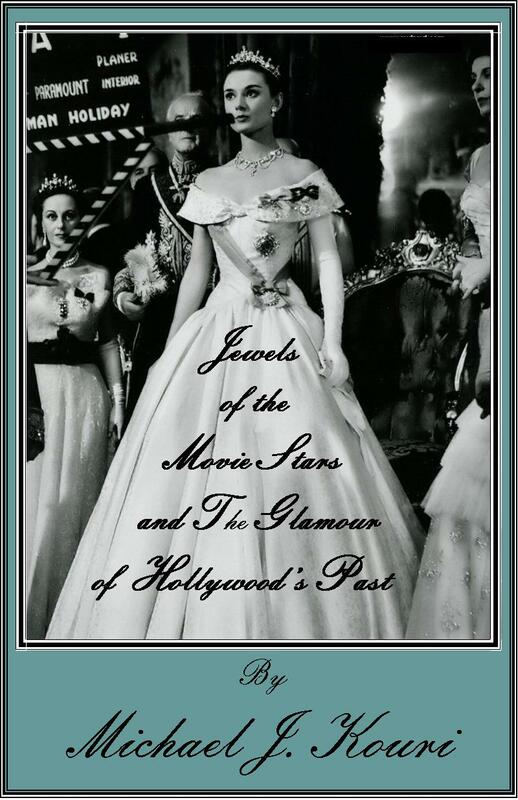 Michael has sold these and other pieces he's taken on consignment from other collectors of Movie Star and Television Props that have been photographed to appear in a new book he's currently writing called Jewesl of the Movie Stars and the Glamour of Hollywood's Past. 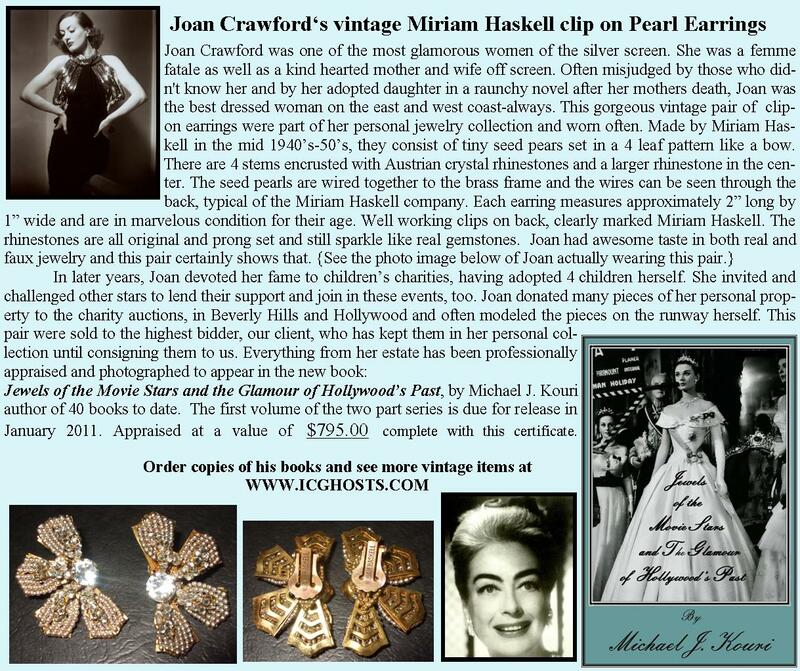 Here in time for the holidays you'll find vintage jewelry worn by Agnes Moorehead, Elizabeth Montgomery and Casey Rogers all of whom worked on the cult classic T.V. Show Bewitched. The prices of the items can be found below and are often less than the appraisal price. We'll certainly combine items to save you mone on shipping fees. 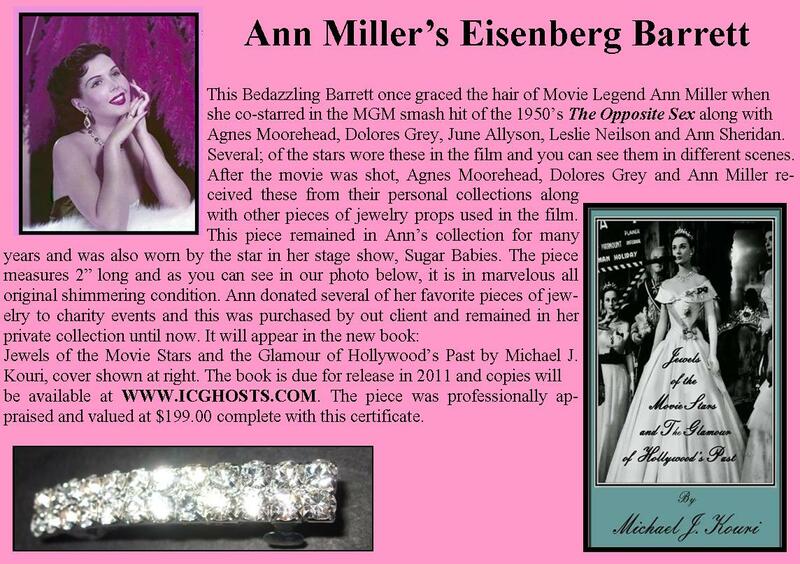 This New Book will also include a DVD with images, music and more showcasing these gorgeous props in full color. Scheduled for release in Spring of 2019. Michael's Special Hematite Hearts, Stars, Rounds and Pyramids help promote Safety and Grounding for daily life. Combined with Amethysts, Garnets, Malachites or Lapis, they've been know to help with the pain of Arthritis, Fibromyalgia, Lupis and pain from Migrane headaches. Michael's clients have been pleased with these custom made pieces for the past 10 years. Doctors wear them as well as people who just want something unique and different. Tell us what you're aches are and Michael can custom make you a bracelet or Anklet for you. There are stones to help one Astral Travel, Feel Safety around them, Protection, Beauty and Style, too. These are Michael's own design and copyrighted. He currently makes bracelets for people the pain associated with Arthirits, Men/Women's Cancers, Diabetes, poor vision, Lupis, Fibromyalgia, Migrane Headaches, Kidney Stones, Gout, and other illnesses. Clients have sent hundreds of emails praising his bracelet for the release of pain from diseases, however we cannot guarantee they can heal. Natural stones are pretty powerful and can be used to aid with illness. Are you into collecting Antique, Modern or Vintage Dolls,& Toys? Do you find them Scary? Michael J. Kouri's other website. educates of Doll Houses, Miniatures, Accessories, Antique, Modern or Vintage Dolls, Toys and Teddy Bears, too. Our Quarterly Mazanie can be ordered, there too.